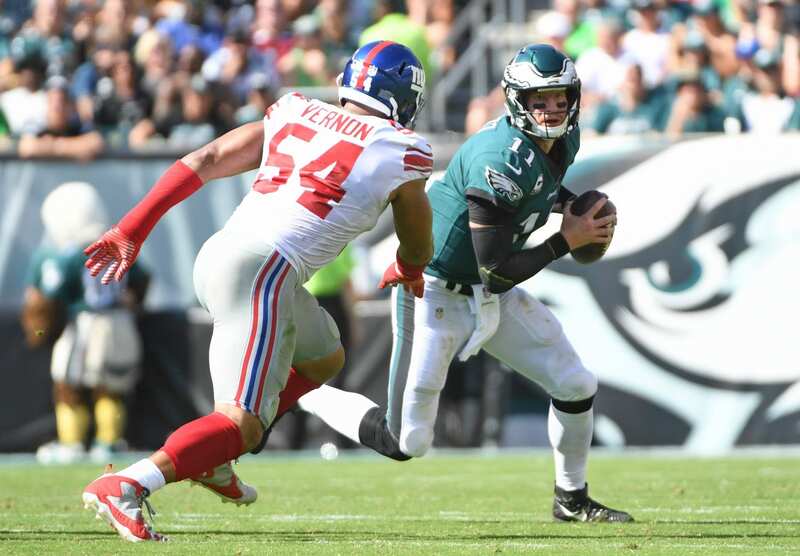 When defensive coordinator for the New York Giants, James Bettcher, took one look at Olivier Vernon, he knew what must be done to extract the most value from the dominant defensive end. Vernon has struggled to live up to the expectations set forth after signing a massive five-year, $85 million deal. The Giants’ defensive end has only recorded 15 sacks in two season in New York. He missed four games in 2017 due to injury. For comparisons sake, Bettcher helped Chandler Jones rack up 17 sacks last season to lead the NFL. How did he do so? He transition Jones to an outside linebacker from edge rusher. This allowed Jones to exploit gaps in the offensive line and keep the offense on their heels. Bettcher brings a 3-4 defense to the Giants, which relies on three down lineman and linebackers to filled the gaps in the running game and get after the quarterback. Vernon will play an outside linebacker role, similar to Jones in 2017. As he grows in comfort with the scheme and his assignments, we should expect to see an uptick in his sack totals. While Vernon has lacked in sack totals, we can’t ignore his ability to put pressure on the quarterback. In 2016, he managed 86 pressures, trailing only Khalil Mack (96). Can #Giants EDGE defender Olivier Vernon lead the NFC East in sacks this season? As a linebacker, Vernon could increase both totals as he will start from an upright position and utilize his hands and momentum to get around the edge. As an OLB, he will line-up a bit further than a tradition edge rusher, giving him the ability to swing inside and work cohesively with B.J. Goodson and Alec Ogletree. If Vernon can refine his skill set and improve for the season ahead, we could see a completely different player come September. Making the transition to OLB is difficult, but Vernon played a similar role while in Miami. His muscle memory should assist in getting a grasp of the system rather smoothly. When testing the new scheme against the offense, safety Landon Collins expressed his excitement about the new defense, as it has given Eli Manning headaches due to five pass rushers blitzing Manning on nearly every snap. Under Steve Spagnuolo we saw a blitz heavy defense, but Bettcher utilizes his pass rushers even more-so. The league average of blitzing in 2017 was 28.2% on dropbacks – Bettcher sent the blitz 36.6% of the time. We should expect to see Vernon play a vital role in the new system.